Today, adults wearing braces make up about half of all orthodontic patients in the United States. It is never too late for an adult to attain a healthier mouth, straighter teeth, and a perfect smile. Dr. Barry Glaser and the team at Glaser Orthodontics are experts in adult braces in Mohegan Lake, NY. 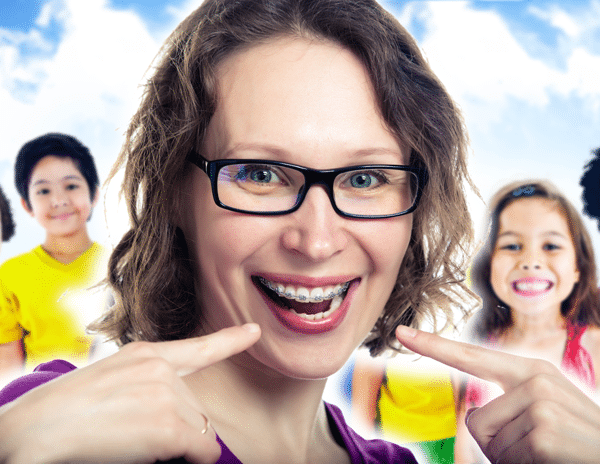 There is a general misconception that braces are worn only by children and teenagers. But, orthodontic treatments with braces have evolved considerably in recent years. Braces have become more lightweight and easier to install and remove. At Glaser Orthodontics, adults are choosing orthodontic treatments with braces more and more frequently. Dr. Barry Glaser understands the reasons why an adult near Mohegan Lake, NY may need to wear braces, and he helps each patient attain their treatment-outcome goals with sensitivity and compassion. The Glaser Orthodontics team offers a wide range of orthodontic treatment options currently available for adults. Invisalign a.k.a clear aligners: Clear, easily removed plastic tray aligners that are ideal for adult patients with mild teeth-spacing issues. The aligners are able to be removed while eating, when brushing teeth, and when flossing. This is a healthy and hygienic choice for adults considering braces near Mohegan Lake, NY. These braces are almost invisible and are preferred by people who feel self-conscious about appearing in public with braces on.